But a club insider has told Claretandhugh that he would not be available for the game against Leicester City at the London Stadium this weekend. 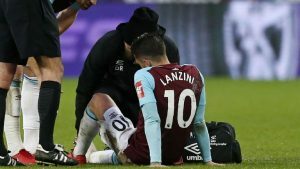 There’s in no indication yet of the severity of the problem as groin injuries are among the most difficult to assess although he could be out for anything between a fortnight and a month. He pulled up with the injury during the second half as he was beginning to have a real impact on the match. He attempted to continue but eventually was forced to leave the action. Meanwhile Aaron Cresswell is expected to rejoin the squad this week having recovered from a knee problem although such was Arthur Masuaku’s contribution that he is likely to hold onto the left back spot for the Foxes clash.